The Odisha Knowledge Hub ( OKH) lecture series was started on Friday with lightening of the lamps jointly by the Minister, Finance Sri Pradip Kumar Amat, Minister, Panchayati Raj Sri Arun Kumar Sahoo, Minister Food Supplies & Consumer Welfare Sri Sanjaya Kumar Das Burma Minister Energy and Electronics & IT Sri Pranab Prakash Das in the secretariat conference hall on Friday morning. The first lecture of the series focused on Financial and Health Service Transformations in India. Eminent thematic expert Dr. Nachiket Mor presented the lecture on the topic with latest updates and emerging trends for about an hour. The Chief Secretary Sri Aditya Prasad Padhi, Additional Chief Secretary to Chief Minister Sri. Upendra Nath Behera, Development Commissioner Sri R. Balakrishnan along with Principal Secretaries, Secretaries, Special Secretaries and other senior officers of all departments participated in the series. The Collectors of various districts also participated in it through video conferencing. Replying to the media query after the lecturer Chief Secretary Sri Padhi said the objective of the lecture series is to bring outside expert input to Govt System. Such lectures will be organized in regular intervals. The new inputs from outside will be customized as per Odisha context to enhance performance level and service delivery in coming years. Development Commissioner Sri Balakrishnan said that lessons about new ideas and best practices can be gathered from various quarters. The present initiative has been started with this objective. Themes and Subject matters for such lectures would be selected as per the priorities of the State Govt. The initiative has been taken through planning & Coordination Department. OKH will provide a platform to facilitate knowledge sharing among multi stake holders and to capture the best practices for strengthening the good governance in Odisha. Dr. Mor said sharing of new ideas helps in initiation of innovative practices and Odisha has been a forerunner in this field. It may be pertinent to mention here that Dr. Mor is on the Boards of Reserve Bank of India, the National Bank for Agriculture and Rural Development ( NABARD), the Micro Units Development and Refinance Agency ( MUDRA), and the Credit Rating Information Services of India Limited (CRISIL) . In addition, he is Chairperson of RBI’s Advisory Committee for the Licensing of payments Banks, and a member of the Government of India’s Task force on primary Healthcare Rollout and of the Task Force on Global Health at the National Academy of Medicine in Washington . The national and international scenario on financial inclusion and health service delivery figured in the lecture presented by Dr. Mor. The participants provided the Odisha context in to it and many good practices were deliberated through this synergy. The Odisha Knowledge Hub ( OKH) lecture series was started on Friday with lightening of the lamps jointly by the Minister, Finance Sri Pradip Kumar Amat, Minister, Panchayati Raj Sri Arun Kumar Sahoo, Minister Food Supplies & Consumer Welfare Sri Sanjaya Kumar Das Burma Minister Energy and Electronics & IT Sri Pranab Prakash Das in the secretariat conference hall today morning. 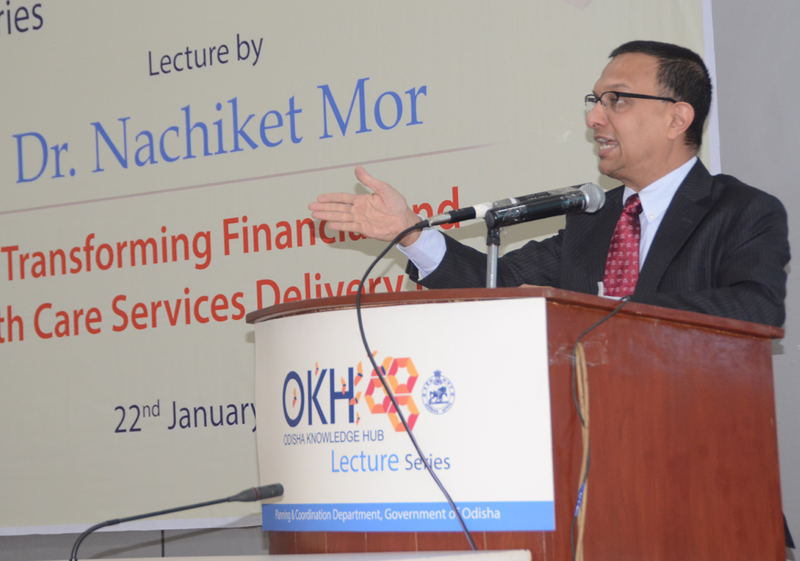 The first lecture of the series focused on Financial and Health Service Transformations in India. The eminent thematic expert Dr. Nachiket Mor presented the lecture on the topic with latest updates and emerging trends for about an hour. The Chief Secretary Sri Aditya Prasad Padhi, Additional Chief Secretary to Chief Minister Sri. Upendra Nath Behera, Development Commissioner Sri R. Balakrishnan along with Principal Secretaries, Secretaries, Special Secretaries and other senior officers of all departments participated in the series. The Collectors of various districts also participated in it through video conferencing. Dr. Mor said sharing of new ideas helps in initiation of innovative practices and Odisha has been a forerunner in this field. It may be pertinent to mention here that Dr. Mor is on the Boards of Reserve Bank of India, the National Bank for Agriculture and Rural Development ( NABARD), the Micro Units Development and Refinance Agency ( MUDRA), and the Credit Rating Information Services of India Limited (CRISIL). In addition, he is Chairperson of RBI’s Advisory Committee for the Licensing of payments Banks, and a member of the Government of India’s Task force on primary Healthcare Rollout and of the Task Force on Global Health at the National Academy of Medicine in Washington .